Since Jennifer posted on the bachelor tax in this column last week, I thought it would be fun to take a look at getting married in colonial America. Many of our modern wedding traditions developed during the Victorian era and differ considerably from what was customary in the 18th century. So let’s jump in and take a look at what a colonial bride’s wedding looked like. 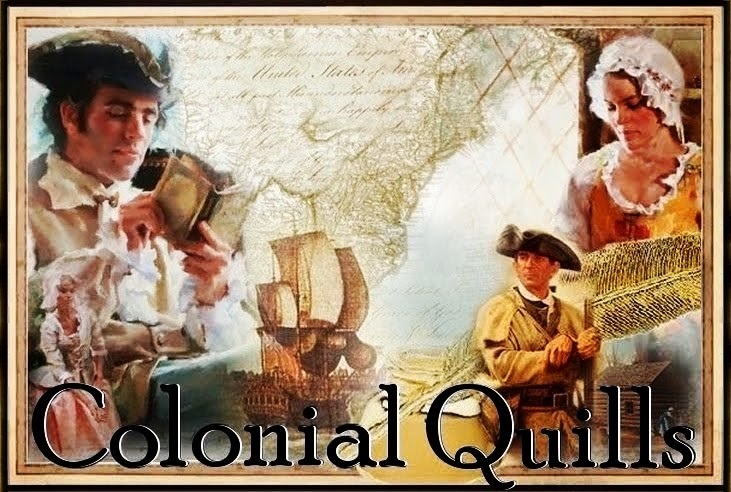 And be sure to also check out my American Patriot Series blog for a lengthy, but highly entertaining article by Anne Morse Earle on marriage customs in New England. We often think that young women married at an early age in colonial America, but that wasn’t true. On average women married in their late teens or early twenties. Among the lower classes in Virginia, the average age of brides was 23, with grooms averaging 26. Any free white person over the age of 21 could marry, provided they obtained a license or had banns published by their church. Those under the age of 21 could not marry without the consent of a parent or legal guardian, and anyone serving an indenture or apprenticeship had to get permission from their master or mistress. It was illegal for a white person to marry a black person, whether they were enslaved or free, and Virginia did not recognize marriages between slaves. There were two ways to marry legally, either by obtaining a marriage license, which stated that both parties were legally old enough to marry or had their parents’ or guardians’ consent, that there were no objections to the marriage, and that both parties were legally able to wed. A marriage license cost more than having banns published, but it allowed couples to wed more quickly. If a couple had banns published, the notice of their intention to marry had to be published either verbally or in writing for three consecutive meetings of their church. If they lived in different parishes, then the banns had to be published in both parishes. This allowed any member of the community who opposed the marriage to make their objections known. If no objections arose, a document was issued that certified that the couple could marry. This was the cheaper option, but the couple had to wait longer to be married. Now for the most important part—the wedding gown! 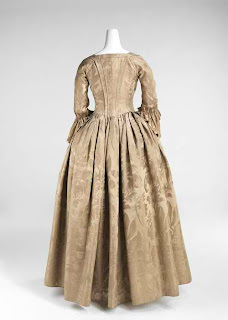 It may surprise you to learn that in colonial times women wore a variety of different colors on their wedding day. White did not become the color of choice for brides until the Victorian era. Instead, colonial brides wore their very best gown or purchased the finest they could afford for the wedding. Since fine textiles were costly, brides didn’t wear their gown only once. After the wedding, they typically wore it for other important events as well. 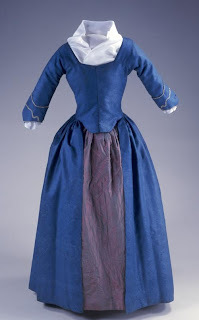 Diadema Morgan (1764-1788) wore the blue wool gown shown here at her wedding to Phineas Field of Northfield in 1785. The petticoat and kerchief are modern additions. The most popular months for colonial weddings were late December, January, and early February, although couples married throughout the year, with the exception of Lent and the week before Christmas. By the 1770s, rituals traditionally performed in churches, including marriages, were often performed in homes. Church marriages always took place before noon. In Virginia, regardless of where the wedding was performed, the ceremony had to be conducted by a minister of the Church of England for it to be recognized. Colonial wedding feasts were elaborate affairs that often lasted two or more days, depending on the family’s wealth and the customs of the community. The families would serve the most expensive foods in the largest quantity and the best manner they could afford. Typical foods served included fish or clam chowder, stewed oysters, roasted pig, venison, duck, potatoes, baked rye bread, Indian cornbread, and pumpkin casserole. There would be trays of nutmeats and candy. Coffee and tankards of spiced hard cider or punch made with hard cider combined with sugar, lemons, and limes were popular beverages. Unlike our modern tiered wedding cakes, the bride’s cake was a thick, rich, spiced cake made with alcohol, dried fruit, and nuts similar to what we know as a fruitcake. It often had a piece of nutmeg baked inside, and the person who received the slice with the nutmeg was supposed to be the next to marry. Since the Middle Ages, common law marriages were accepted in England, and immigrants brought the custom to the colonies with them. Couples who didn’t have their parents’ permission or who couldn’t marry for other reasons might choose to speak marriage vows alone or before witnesses. They joined hands and declared that they took each other to be husband and wife, and then lived together. This was called “handfasting” or “spousal.” It was not unusual for blacksmiths to officiate at a handfasting, and the anvil came to symbolize the forging of long-lasting unions. There was a version of this kind of contract called the spousal de futuro, a marriage contract to be consummated at a later date, similar to the modern engagement. It wasn't rare for the couple to jump the gun and the girl to consequently become pregnant. In that case, they were considered to be man and wife. 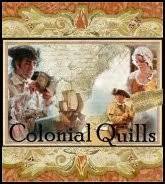 For the colonists, pregnancy sealed the marriage. Here are some helpful links if you want more information. Note: Come by Colonial Quills on Saturday for a Bride's Cake recipe. You might be surprised at the ingredients that went into this version of a colonial wedding cake! Joan, Wow! What a feast of information you give us! So appreciate the pictures, too. Both gowns are lovely, especially the brocade. I find is especially fascinating that the anvil signified long-lasting unions as I'm writing about a blacksmith. I'm familiar with handfasting and think it was popular in Scotland. Thanks so much for a wonderful post. You're so welcome, Laura! It was sure fun researching this. Love the gowns, and especially the brocade too. The workmanship is lovely indeed. There was lots of info about marriage in colonial times that I wasn't familiar with, especially some of the variations that were generally accepted, though I'd read about handfasting. Love this sort of post. I'm such a girl, LOL. ;-) Thanks for sharing, Joan! I learned so much! Great post! This is great information Joan. I've been researching the topic too, and all the ways that couples and even ministers and justices of the peace ignored the various strict marriage laws, despite the risk of fines. Hey, Roseanna, aren't we alll such girls. lol! Thanks, Faye! Lori, I guess when you think about it, there were as many variations in how couples got together back then as there are today...except now nobody gets fined! Fascinating, Joan. Thanks so much! I posted this to FB and Twiiter. Joan this is such fascinating stuff. I am loving every word. You are a gem! I've learned in my own research that in Massachusetts/Maine it was illegal in the 17th century early colonial days to be married by clergy and a magistrate had to officiate. Pat, isn't it interesting though that the Patriot bundling scene took place in the south and it was a New England tradition. Someone didn't do their research! I'm really enjoying this column with our talented author/researchers! Yes-- and did you know they did a huge article when the movie came out in Newsweek magazine on all the detailed & "accurate" research done through the Smithsonian on the story? Mel Gibson is supposed to be a stickler for detail on his productions....hm-m-m. To bad he didn't have the Quills to help out! Loved this post and very informative. Handfasting was very common in Scotland, and particularly in the Highlands long before the colonial period. Great info! I'm looking forward to the cake, too! I've read about the common law marriages. Thanks for shedding more light on it! My nephew recently married a girl whose family are Ukranian Catholics. A part of their ceremony was tying the hands together. They said this has been a tradition for centuries. A very beautiful image of marriage. Hadn't heard about "handfasting." Interesting tradition. And the gowns are beautiful. Well-researched blog post! Perfect timing on this post. I am currently writing a wedding into my book. Thank you for the information. Thank you so much for this important information.. This is going to help me get an A+ on my report for class! !